Hawker food stalls are an iconic feature of Singapore’s cultural landscape, as well as one of the best places to get some seriously tasty food. The hawker trade faces an uncertain future in Singapore, however, with the average age of hawkers now nearing 60 and the younger generation unwilling to take up the unglamorous job. Long hours and low profits mean that ownership succession is falling, putting Singapore’s hawker stalls at risk of disappearing forever. Hawker stalls are renowned not just for their incredibly cheap prices, but also for the amazing quality of the food, with some stalls even being awarded coveted Michelin stars. There’s no better way to eat during a visit to Singapore and we’ve rounded up the best places to sample delicious hawker food before these iconic stalls disappear. Chinatown Complex is the biggest hawker centre in Singapore, with a whopping 260 food stalls to choose from. If that seems like a bit of an overwhelming number, just do what the locals do: judge the stall by the size of the queue. The longer the queue, the better the food is likely to be. When the Michelin Guide to Singapore was released, the Chinatown Complex’s Hong Kong Soy Sauce Chicken Rice & Noodle, which was awarded a star, became an overnight sensation with six-hour long queues. There are stalls selling all the local food you’ll be dying to try during your tip, from satay to frog porridge. Old Airport Road Food Centre is one of the oldest food courts in the city and has been serving great local food to people for generations. With its open sides that let the air flow through and its basic tables and chairs it may not look like much, but Old Airport Road is home to some of the best hawker stalls you can find. The food court is often hailed as having the best soya bean curd stalls around, with Loa Ban Soya Bean Curd and 51 Soya Bean Curd enjoying lengthy queues at all times of day. It’s an absolute bargain at around $1.50 for a bowl, although you’ll have to spend a little more if you want to try the delicious almond flavour. Located in the heart of Chinatown, the Maxwell Road Food Centre is one of the most likely to be packed with locals. The centre itself is more functional than stylish, but that hardly matters when it’s home to some of the best food stalls in the city. Tian Tian Hainanese Chicken Rice is widely known to make the best chicken rice in Singapore, so make sure you don’t miss it. Fish dishes are a speciality here and it’s definitely the place to try the locally revered fish-head curry, which comprises a fish’s head served with a coconut and coriander curry. Swill it down with a huge glass of teh tarik, a Singapore speciality of tea served with condensed milk. Chomp Chomp Food Centre has different opening hours to other food centres, which usually open for breakfast and close in the evening. Chomp Chomp instead starts at 18:00 and continues late into the evening, satisfying your appetite for delicious hawker food late at night. Don’t be put off by the slightly unusual location in a residential estate, Chomp Chomp has some of the best stalls and is worth the effort of seeking it out. Many Singaporeans say that Chomp Chomp has the best satay in the city, so get yourself down there and load up on your favourite variation. Zion Road Food Centre is one of the smallest in Singapore, but what it lacks in capacity it makes up for in quality. 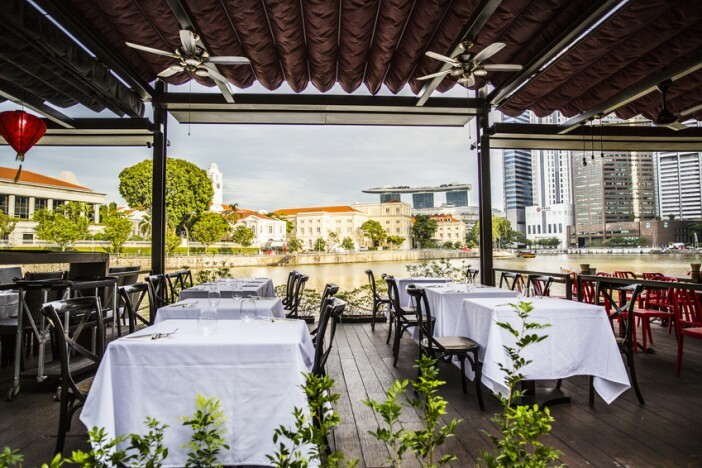 Rumour has it that it’s a regular haunt of Eric Teo, president of the Singapore Chefs’ Association, who comes here for food inspiration and a seriously good meal. Fried kway teow from stall number 18 is apparently one of his favourites. If that doesn’t take your fancy, Zion Road is also great for rojak – a mixture of spinach, mango, ginger, and veggies. Order yourself some youtiao, or Chinese fritters, and enjoy a top-quality meal squeezed under the low canopy roof. Timbre+ is a bit different from other food centres, having been developed with the aim of getting the younger generation into hawker food. The trendy space is home to contemporary and western food stalls, as well as ones giving traditional dishes a modern overhaul. Shipping containers have been repurposed onto stalls, the space is sprayed with cool graffiti, and the latest music can often be heard over the hubbub of chatting youngsters. Stand-out stalls include The Fishball Story, started by young ‘hawkerpreneur’ Douglas Ng to honour the culinary legacy of his grandmother’s homemade fishballs. The stall features in the Singapore Michelin Guide and is a favourite among visitors and locals alike. If this guide has made you want to try Singapore’s famous hawker food for yourself, why not book one of Cruise1st’s amazing deals on a cruise to Singapore? Browse the full collection online or call our friendly sales team on 1300 857 345.